Jeff Seymour - Author of Fantasy, Literary Fiction, & c.: The Grand Experiment: Analytics! Well, sort of, anyway. I've been taking a look at the statistics of Soulwoven as it stands on Wattpad and want to share a couple of things. First off, my rankings have dropped off significantly since last week, and I've seen a corresponding drop in reads. I'm averaging more like 40 per day at this point. So it's clear that a lot of people find new stories to read on Wattpad through the rankings. Beyond that, because Wattpad tracks reads for each chapter individually, I can note the following. 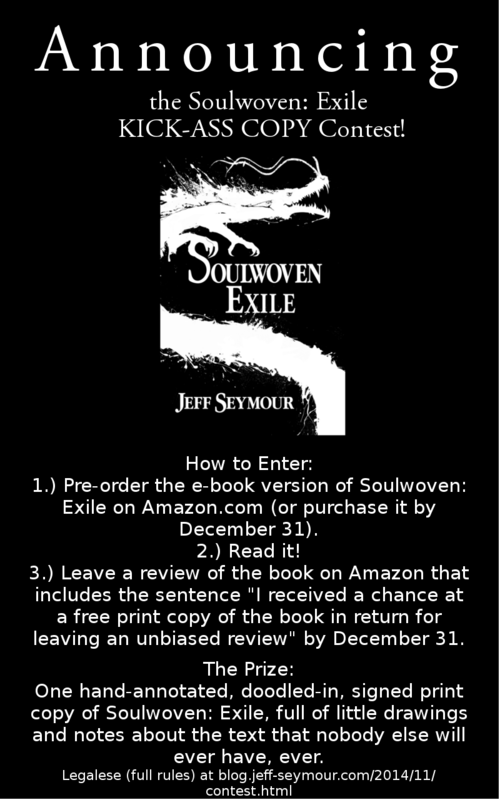 The first chapter of Soulwoven has been viewed 314 times. About half of those people (156) made it to Chapter 2. Everyone who read Chapter Two made it to Chapter 3. 134 people made it to Chapter 4 and Chapter 5, 123 reached Chapter 6, 104 reached Chapter 7, and only 69 made it to Chapter 8. Chapter 9 has 64 reads, and by Chapter 10 I'm down to 48. Chapter Eleven has 40 reads. Chapter 12 just went up yesterday, and it has 29 reads, and in the two hours since Chapter 13 went up, it has 18. I'm making the major assumption here that my own and other people's views of the chapters mostly cancel each other out (i.e. nobody is repeatedly viewing Chapter Seven and only viewing Chapter Eight once). I can also see that I've got around 30 or 40 readers keeping pretty on top of the book as it updates. I have a suspicion that that may be mostly traffic from my Facebook links, which would help explain why many of the latest chapters only have votes and comments from people I know. And, maybe most importantly, these numbers give me a great opportunity to look at where I'm losing people's attention. They're skewed right now because not every chapter has been up for a similar amount of time, but after six months or so that should be much less of a factor, and I may be able to identify problematic chapters (right now it's looking like I may be losing people at Chapter 7, for instance). In order to see how I'm stacking up, I decided to take a look at the stats on Aaron Kite's A Touch of Poison, which has held the #1 spot in Fantasy on Wattpad for most of the summer. Its stats are as follows: 136,544 reads on the first chapter. 87,910 on the second. 82,017 on the third. 67,771 made it halfway through, and 36,355 finished it. So viewing things in those terms, I guess I'm doing alright keeping the attention of my readers, though I find the 50% read-through rate of the first chapter a little discouraging. It will be interesting to see how things change when the full book goes up and people have the option of reading all the way through as quickly as they want. You'll note I've stopped talking about Authonomy. That's because I've been offered a pretty fantastic promotional opportunity on Wattpad, and I want to focus on getting through a heavy-duty revision of Soulwoven in preparation for it. Once that's all in place, I'm going to turn my attention back to Authonomy, and possibly get involved with Figment (a smaller, Wattpad-esque community) as well.